IT'S BEEN ALMOST A YEAR SINCE I BLOGGED! Terrible. I noticed Instagram gets more attention than the blog so hey, why blog as often, right? Wrong. I'm back and I'm ready to bring you guys some of the tastiest spots Miami has to offer! I've had my eye on this spot since I stumbled across a picture of their Carne Asada Fries via Instagram.. 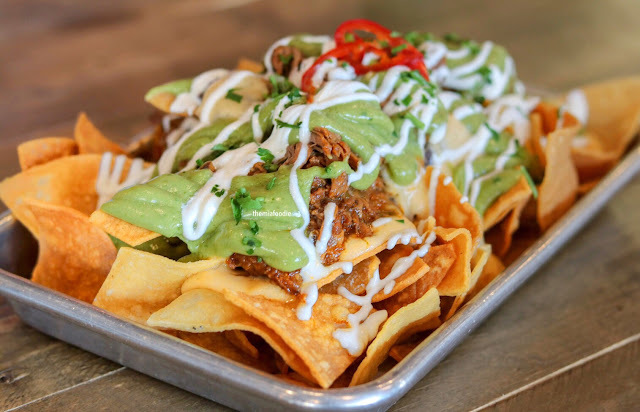 Founded by Coyo Taco veteran Anna Robbins, 222 Taco is located in the small city of North Bay Village inside the strip mall on the 79th Causeway. A little further than the typical neighborhood's I end up in thanks to food but I had to see what the hype was about! A taco joint that serves all-day breakfast, lunch and dinner? Count me in. Mexican embroidery and colorful accents fill the restaurant, the decor was definitely my favorite part of the experience. It gave me a retro-Mexican feel and although they've been in business since April, it wasn't until recently that I had a chance to stop by and check them out. Apart from the full service Margarita bar where you can grab a drink or catch a game, 222 offers an adorable "tiendita" towards the back where you can shop for authentic Mexican novelties, paletas (didn't try any but I did see an "arroz con leche" flavor I must go back & try), baked goods, coffees and Mexican Jarrito sodas.